This 1945 Parker 51 Vacumatic-filler set in India Black has a 14K solid smooth gold cap, clip, and bottom tassie. The barrel imprint is deep and crisp. This is a new-old-stock, mint in original box, with a fine nib. This is a very classic, elegant set! To fill a Vacumatic-filler correctly, it takes several strokes (sometimes up to twelve), pausing briefly in between each stroke. If you remove the nib from the ink with the button depressed, and then release it, any ink in the collector will be sucked in and this will avoid excess ink leakage. 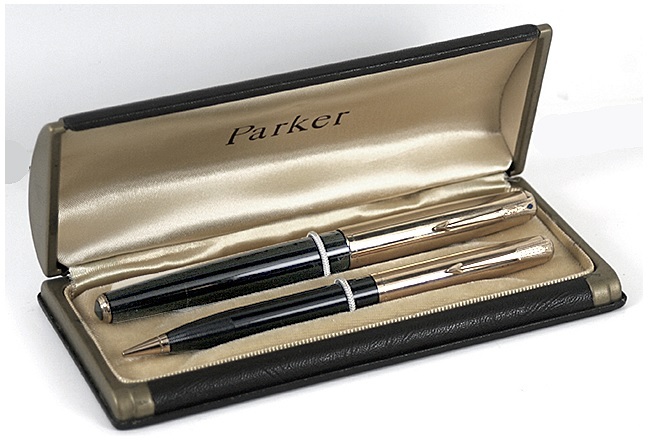 Pen #7 in Catalog #77 – available for your Parker 51 collection!